If Marine Le Pen had won the French presidential election, Brussels and Frankfurt would already be discussing crisis plans for saving the euro in the likelihood of a Frexit. But the Elysee Palace is now occupied by Emmanuel Macron, who won the elections with a pro-European programme and a vision for the future of the euro area. That is why Brussels has decided to warm up the euro area reform dish. 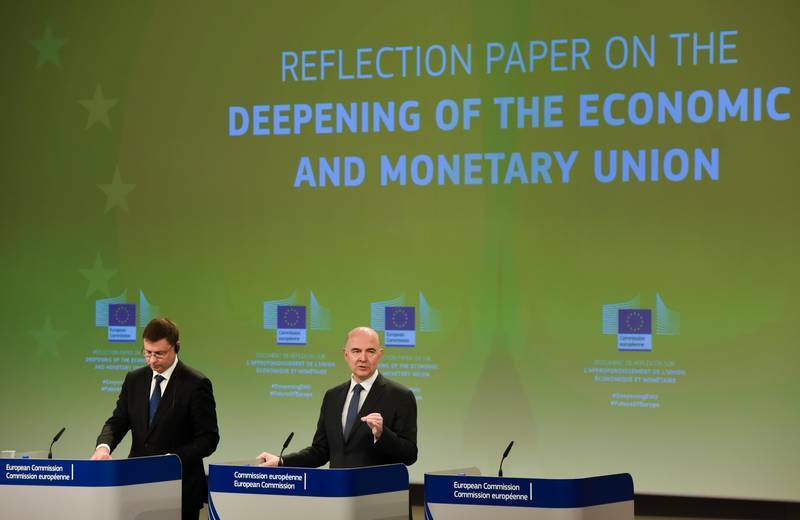 This week, the European Commission presented its long-awaited vision for the future of the Economic and Monetary Union (EMU) in the popular for this Commission format of a "reflection paper". Let me warn you, however, not to have big expectations. The document is essentially not new, although it contains some new elements. In this sense, it is not a successor to the five presidents’ report, which in turn succeeded the report of the four. What is then its purpose? Generating a new impetus to complete the euro area without the pressure of a crisis at that. In this sense, the analysis in the document is the more valuable part of it. The tide is turning now, as Eurosceptics have lost elections (Austria, The Netherlands, France) or are failing (the UK) in key countries. Emmanuel Macron has made a clear statement that he will be the leader not only of France but also in the EU and his first steps on the European and international scene are a clear signal for that. He has succeeded in convincing otherwise sceptical German Chancellor Angela Merkel that his intentions are genuine and that the joint Franco-German task force on the future of the euro area is already engaged in serious work. Another factor is the good economic performance in the euro area - total unemployment has dropped significantly, economies are rising, inflation is slowly rising. These factors, however, alone and even together, are not enough to generate motivation to work on completing the currency club. What can be used as an incentive is that, with Britain leaving, the euro countries’ economies will account for 85% of the EU's total gross domestic product. "This highlights the euro’s central role in the future EU at 27", the document says. With it the Commission kindly urges non-euro countries, which do not have a special opt-in (Denmark) to join. It has not been written explicitly, but has been hinted at in a number of places, as well as in statements by the officials responsible for the euro and the economy as a whole, such as Vice President Valdis Dombrovskis (Latvia, EPP) and Pierre Moscovici (France, Socialists and Democrats). "The EMU and its completion must remain open to all EU Member States. The integrity of the single market must be preserved. This is also key for a well-functioning single currency. According to the Treaty, except for Denmark and the United Kingdom, all EU Member States are expected eventually to join the euro", goes the document. This means that the integrity of the single market is jeopardised if it remains fragmented between the euro area and the rest. "It is the view of the Commission that all Member States have an interest in designing the future of the EMU. This triggers a debate on the decision-making process. Some argue that mechanisms should be set up to allow euro area Member States to take decisions amongst themselves, with a strengthening of the Eurogroup, and in the European Parliament. This political question might be less of an issue as more Member States join the euro over time", is another quote from the document, which for the first time presented the enlargement of the euro area as a solution to the architectural problems, which are currently hindering the deepening of integration in the common currency area. One of these problems is the governance of the euro area. Among the ideas set up so far is the establishment of a euro area treasury, which is accountable not only to national parliaments but also to the European Parliament. In the May 31st document, the EC proposes a new balance to be created between the EC and the Eurogroup. It proposes the establishment of a euro area finance ministry to deal with economic and fiscal coordination, the issuance of possible Eurobonds and the management of the macro-economic stabilisation function. A little side note, so that we clarify the last two things. The idea of ​​Eurobonds has been roaming for years in the EU, but there are still no suitable conditions for it. That is why the EC in its Reflection Paper offers something similar to Eurobonds, but not quite. This is a new financial instrument for common debt issuance. Due to the high sensitivity of the subject and the likelihood of mutualisation of the debt in the euro area, the EC merely puts the idea, promising to look at the different options later, but does not commit to a specific deadline. The intent is that this instrument, a European safe asset, should be equivalent to US Treasuries. The need for such an instrument is explained by the EC with the fact that the current system, whereby individual members of the euro area issue bonds with different risk characteristics, generates asymmetric supply of safe assets. Experience shows that in times of crisis the current structure of the sovereign bonds market and the large exposure of banks to them contribute to market volatility, which in turn affects the stability of the financial sector and has tangible but also divergent effects on the real economies of the euro area. The euro area crisis has already provided enough material to support this claim. The macroeconomic stabilisation function is an instrument that was proposed in the five presidents’ report with the idea of ​​supporting national budget stabilisers in case of severe asymmetric shocks. Its aim is to ensure the smooth functioning of fiscal policy in the euro area in unusual circumstances when monetary policy reaches its ceiling. Access to this function will be ensured by fulfilling specific criteria, including sound fiscal policy and work on economic convergence. A potential euro area finance ministry will deal with these two instruments in addition to a common budget, unemployment insurance scheme, a European investment protection scheme, a rainy day fund. The EC proposes that this ministry unites the already existing competences and services currently dispersed in various institutions, including the euro area permanent rescue fund (European Stability Mechanism) once it has been integrated into the EU legal framework (it is an intergovernmental agreement). The ministry may be headed by a minister who may be the chairman of the Eurogroup or the Council of Finance Ministers (ECOFIN). To this end, the EC reiterates the idea of ​​setting up a permanent post of Eurogroup chairman who is also a member of the Commission. Something similar to the dual function of the EU High Representative for Foreign Affairs and Security, who is both the head of the European External Action Service and a member of the European Commission (Vice-President). Presidents of the Eurogroup are currently elected by euro area finance ministers for a two-year term. The very format of the Eurogroup itself is informal. The Commission document clearly states that this format needs to be formalised and that its work be more transparent. It urges for the establishment of permanent monitoring by the European Parliament. The Eurogroup meets once a month (unless there is a crisis situation), but its meetings do not end with conclusions. Sometimes the ministers come out with a joint statement. In addition, no minutes of their meetings are published. The transparency of its work is exhausted by press conferences after the meetings, national briefings, a regular dialogue in the economic committee of the European Parliament, and in some cases the Eurogroup president also appears in plenary debates. What the EC wants is that this regular dialogue be formalised and with its participation. The Commission believes that this may be possible as early as the next EP elections in June 2019. The fact that the minister of finance is proposed to be the head of the Eurogroup and/or the ECOFIN Council is another hint of the enlargement of the euro area, as ECOFIN is currently governed on a rotating scheme, changing chairmen every six months. 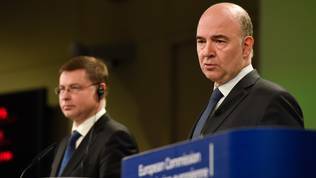 During the presentation of the Reflection Paper, Valdis Dombrovskis and Pierre Moscovici said they were not trying to exert pressure to expand the euro area, but were trying to make the joining of the common currency more attractive. It is the different economic development of the member states not only outside the euro area, but also within itself, as well as the lack of trust. Differences within the euro area create preconditions for a two-speed euro area. According to the EC analysis, the monetary component of the EMU is the most developed, but the other two elements - economic and union - are lagging behind. The lack of sufficient economic integration hinders monetary policy and national economic policies. "More trust is needed across the board, among Member States, between Member States and EU institutions, and with the general public", the document says. 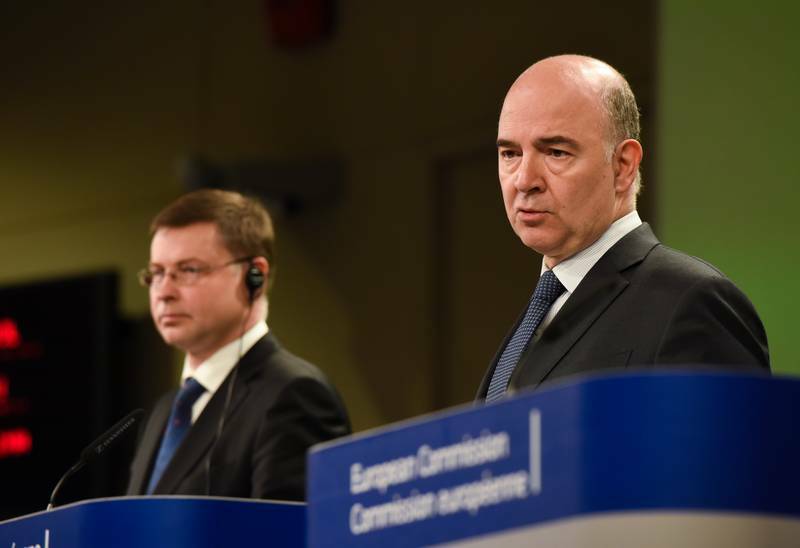 The Commission recognises that the economic convergence trends of the first years since the introduction of the euro have been a partial illusion. Before the crisis, the euro area was a symbol of ever-increasing prosperity. Real per capita income was steadily rising between 1999 and 2007, but this growth was partly fuelled by favourable credit conditions and large capital flows, which, however, often served to pump up balloons. The 2007-2008 crisis marked the end of convergence and started a divergence trend. Right now, a correction process is running but it is still slow. In the reflection paper, the Commission identifies three types of convergence: real (convergence of living standards), nominal (current Maastricht criteria) and cyclical (alignment of business cycles of member states). The EC does not indicate which one is the most acceptable option to it, but so far the second option has proved to be insufficient. The five presidents’ report lists convergence as a top priority and it proposes that this process be more stringent and legally binding on the implementation of specific standards, including the improvement of public spending, investments in education and training, a more open policy towards markets, creating a fair and efficient tax system and social security. It is envisaged to make a link between the implementation of these standards and the access to EU funds and the future macroeconomic stabilisation function. As the leading instrument for economic coordination and convergence is envisaged to be the European Semester, but the EC does not have very specific ideas on this issue. If member states begin to seriously debate the ideas of the Commission, for which there is currently interest, they have to answer a very important question - whether to go for deepening the integration in the euro area without waiting for the non-euro states or wait for them and all go on together. Two years ago, ECB boss Mario Draghi chose the former. The problem is, however, that this will be a slow process that will sooner or later lead to changes in the treaties, and this will require the involvement of non-euro states. In today's unstable political situation, it is difficult to predict what kind of outcome it could have, especially since in some countries this will necessitate the organisation of referendums. The second option is also slow, but requires a clear commitment from the non-euro states about when they will join the currency club and at what rate they will work for economic catch-up. "It is time to put pragmatism before dogma, to put bridge-building before individual mistrust", urges the Commission in the document, but the still unresolved issue with Greece, the emergence of non-liberal currents in the new member states, and the uncertainty resulting from the UK's exit talks are a great obstacle to building trust. Following the presentation of the EC's reflection paper on Wednesday, many responded with annoyance that this is yet another document that Berlaymont produces and which will not see the light of day. However, this is not the case. Following the peak of the euro area crisis, in June 2012, EU leaders instructed the four presidents – of the EC, the European Council, the Eurogroup and the ECB - to propose options for deepening euro area integration. In December of that year, the then European Council head Herman Van Rompuy presented the document, which provided for three phases. The first phase was the completion of the upgrade of the economic governance, the establishment of a banking union. The second phase envisaged deepening of economic integration, and in phase three there was already talk of something similar to a common euro area budget. The first two phases are practically virtually complete. There are a few more details to complete in the banking union, such as the common European Deposit Insurance Scheme, and there is work on strengthening economic coordination that has so far been purely cosmetic. The second report, drawn up by the four presidents plus the president of the European Parliament, was presented in 2015. The emphasis in it was on the work of economic convergence. It sets the task of completing the targets that were not met in the previous report, such as the creation of a financial support in the banking union, in addition to the restructuring fund for banks in trouble. The report of the five as a whole offered a lot of cosmetic changes, which are already more or less a fact. The latest Commission paper is just a reminder of what has been accomplished so far and what is yet to be done, as well as why is it important that this happens now, instead of waiting for the next crisis. 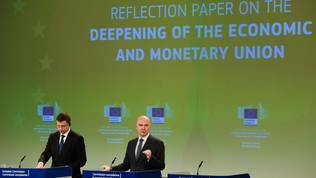 “Our Economic and Monetary Union still falls short on three fronts. First, it is not yet able to reverse sufficiently the social and economic divergences between and within euro area members that emerged from the crisis. Second, these centrifugal forces come with a heavy political price. If they remain unaddressed, they are likely to weaken citizens’ support for the euro and create different perceptions of the challenges, rather than a consensus on a vision for the future. Finally, while the EMU is stronger, it is not yet fully shock-proof”. goes the EC’s explanation. Implementation horizon remains 2025 for the more difficult tasks and 2019 for the easier ones.